UK, 1971, 94 minutes, Colour. Vincent Price, Joseph Cotten, Hugh Griffith, Terry- Thomas, Virginia North, Aubrey Woods. The Abominable Dr. Phibes and Dr. Phibes Rises Again are two excellent Vincent Price classics. They are clever blends of screams, satiric laughs and sumptuous baroque productions. Dr. Phibes was so successful that, apparently, one can't keep a good undead down. His rising was rather self-consciously calculated to bring the fans back to the box office. The sequel may not be as good as the original, but it keeps all the ingredients to make it enjoyable for horror fans. 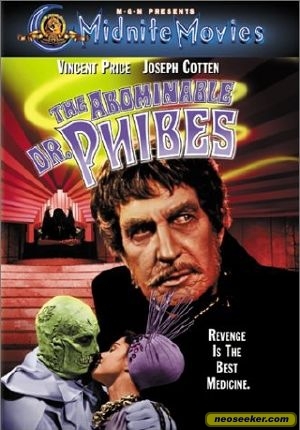 Vincent Price hams effectively as Dr. Phibes. Good English supporting casts in both films success, fully keep proceedings moving, marred only by some cruelty. 1. The quality of this horror film, its style of horror, audience response to horror and humour? Vincent Price's style? 2. How did the film focus on Phibes? The explanation of his past, the advertisement of his past, his organ playing, his doctorate, his relationship with his wife Victoria, his eccentricity? 3. The importance of his house and its decor? The focus on music and the theatrical overtones of the organ, the band? Vulnavia? The sets and the symbol of his return? The atmosphere of the 20s? The bizarre contrast of humour and horror? 4. The details of his plan as a basis for a horror film? The ten plagues, the medallions, the rabbi's explanation, the suspense about the next victims and the pseudo-humour of the murders? 5. The film as a murder-horror film? Interest in the details of the crimes: the bees, bats, locusts, the hall, the doctor being drained of blood, the Impalement etc.? The attention to detail given to these murders? 6. The emphasis on Phibes' skill and the assistance of Vulnavia? 7. The irony of Phibes going home and burning the image? Playing the organ, the musical accompaniment? 8. Did the film build up Doctor Vesalius sufficiently as a contrast to Phibes? His co-operation with the police? The first-born as a threat to him? 9. Comment on the presentation of the police: the chiefs, Trout and his humour, his assistant? The balance of the police humour and the murder and its horror? 10. How well did the film build to a climax? The acid, Dr. Vesalius' untying and getting the key? 11. How satisfactory was the ending? Phibes asleep with his wife? Revenge achieved? A sequel provided for?